Yesterday – a big announcement is over HERE! Even though some of you aren’t interested in my Bible Journaling, you still might wanna see Puppies on Ice! They’re at the start of the video. I’ve added a pretty spectacular painting to my Society6. Campers just make me think of summer vacation – even if I never have take a vacation in a camper before! But a girl can dream, right? This is one of two new Tryfold sets that are tons of fun to put together and color – I used my Prismacolor pencils this time. Watch the video below or click HERE to see it in HD on YouTube. Here are the panels individually, and a picture of the way the card folds. Stay tuned tomorrow – I have FOUR different layouts for those tryfolds! 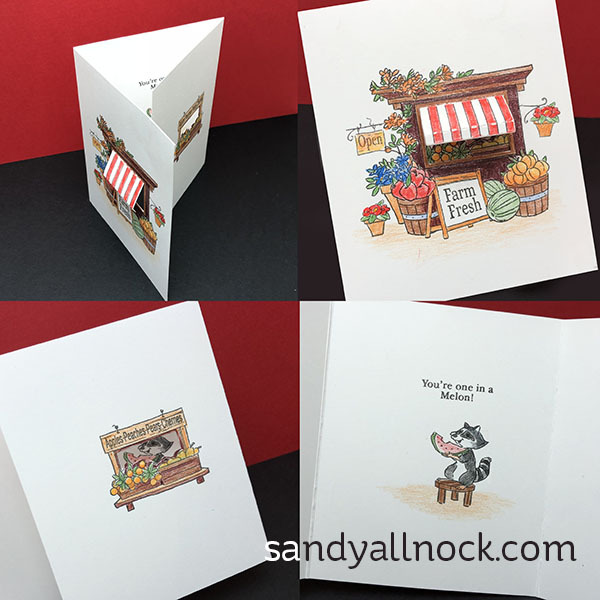 And this little produce stand is adorable – with a little raccoon sneaking a snack inside! The stamp on the front went on a little off-center (user error!) so I compensated by putting the “OPEN” sign on the left and an extra potted plant. So cute. I saw these in a preview and they are on my wish list along with the Twist Ties. Congrats on your design team announcement! So exciting ! These are such cute cards! It’s nice to see how they can come to life! Congratulations on EH Design team–they are so blessed to have you!! Congratulations that you are in the design team of Ellen Hudson! A lot of laughter here by looking the “puppies on ice” great video and beautiful Bible page! And then these gorgeous cards you made, Art Impressions always have gorgeous stamps, the are so funny. Thanks for all the beautiful things you made, it’s a great way to start the week! Congrats on joining the Ellen Hutson Design Team – you will be a HUGE asset!! And, thanks for sharing yet another super card – I learn so much from you! SANDY ROCKS!!!!! 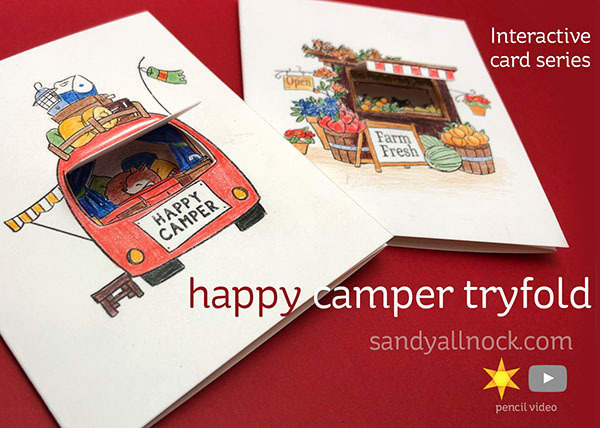 Happy Camper was my favorite from the new release so I was happy to see you do that one, loved it. Watched the bible journaling, left message over there, and CONGRAT’s on the ELLEN H. news, I buy all my supplies from Ellen and SSS,i love that site, so I will really be seeing a lot of you, between Ellen, here and bible, Oh My, LOL. Super Congrat’s again!!!!! The Flutter card with the dog,(OMG) adorable! Have always loved your art work Sandy. Glad you are still doing it. Loved the camping one. Reminded me of our Airstream, when the back window was opened, you would have seen our cat LOUiE sleeping. Brought back many memories. Thanks. 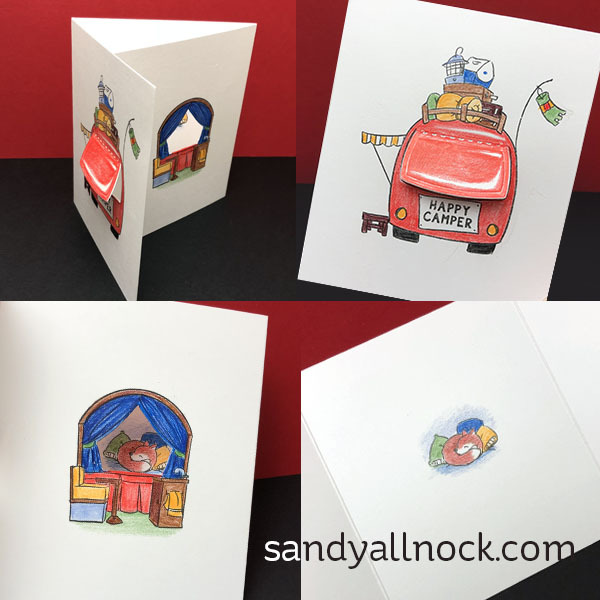 Cute card – and one I think I could actually make! I just checked Ellen Hutson to see the price, and it wasn’t as bad as I’d feared – considering it contains the dies and even instructions! My grandkids call me Grandma Raccoon, (long story), so that cute little fruit stand set will be perfect for me to make & send for most any occasion! Thanks for the cool demo!